No dig organic gardening saves time and work. It requires an annual dressing of compost to help accelerate the improvement in soil structure and leads to higher fertility and less weeds. 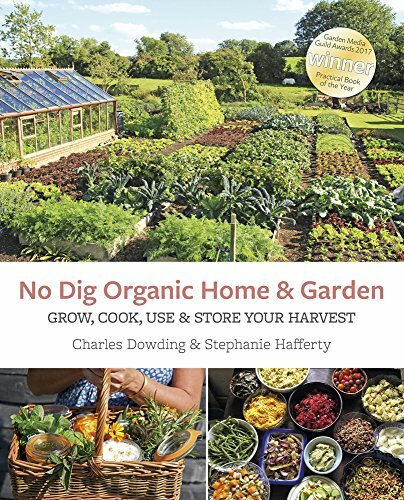 No dig experts, Charles Dowding and Stephanie Hafferty, explain how to set up a no dig garden., They describe how to: Make compost, enrich soil, harvest and prepare food and make natural beauty and clean ing products and garden preparations. These approaches work as well in small spaces as in large gardens. The Authors' combined experience gives you ways of growing, preparing and storing the plants you grow for many uses, including delicious vegetable feasts and many recipes and ideas for increasing self reliance, saving money, living sustainably and enjoying the pleasure of growing your own food, year round., Charles' advice is distilled from 35 years of growing vegetables intensively and efficiently; he is the acknowledged no dig guru and salad expert both in the UK and internationally. Stephanie, a kitchen gardener, grows in her small, productive home garden and allotment, and creates no dig gardens for restaurants and private estates.She presents truly delicious seasonal recipes, made from the vegetables anyone can grow. She also explains how to use common plants you can grow and forage for to make handmade preparation for the home and garden.